The continuation of a trip to Ávila with Sandra, Alfons, Rune and me. 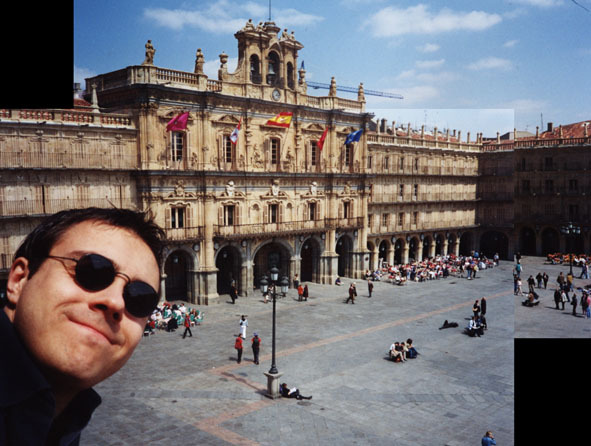 The ride on the car from Ávila to Salamanca was much more relaxed than from Madrid to Ávila as the route is less curvy - apart from one incident when Sandra, out of excitement, nearly smashed the rear mirror inside the car when we were overtaking a lorry. Salamanca, student city with a lovely centre. 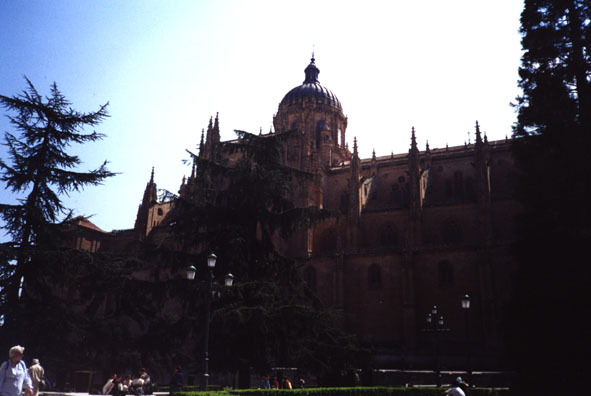 It has two cathedrals, and the university is the oldest of Spain and also in the centre situated. 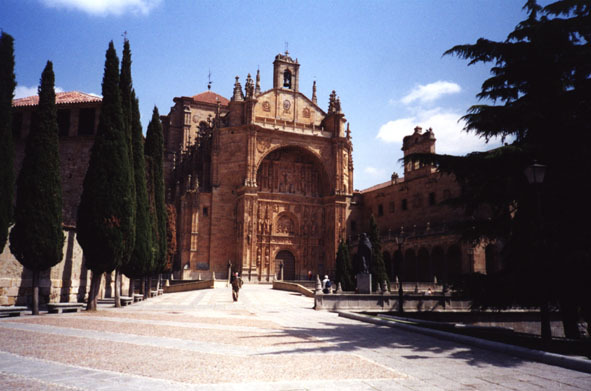 Salamanca is two and a half hours away from Madrid (by car). 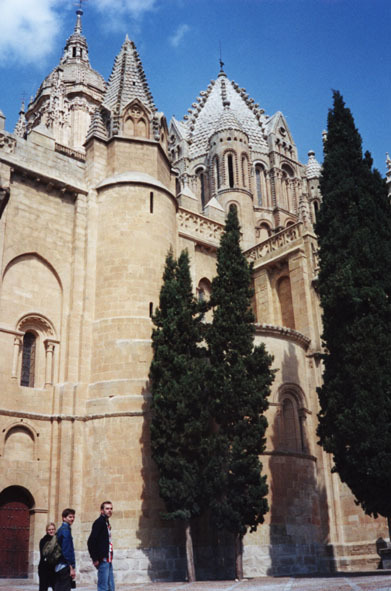 Cathedral number one - photographed from the Convento de Domingo Sanmartin. The Facultad de Filosofía y Letras - studying like centuries ago. 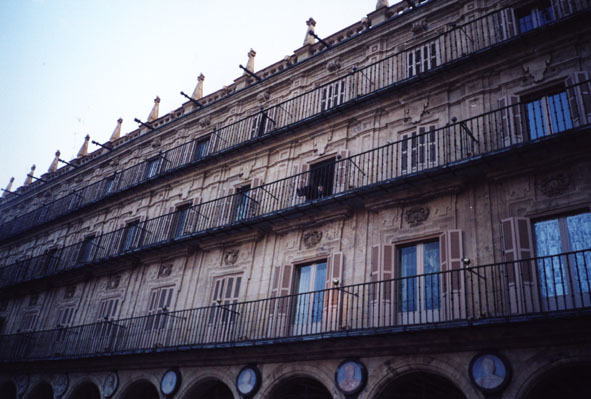 The character of Salamanca is made up by that everything is "condensed" in the centre. All the beautiful old buildings, churches and the university departments are there "put together", nearly all build with bricks of a beige-brown-yellowish colour that gives the centre a warm and bright touch. 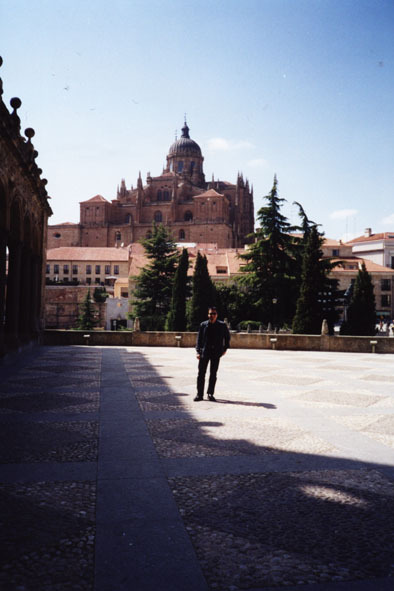 Salamanca is one of the cities where I already commented after one hour "I willl return" - as I did when I was the first time in Barcelona. 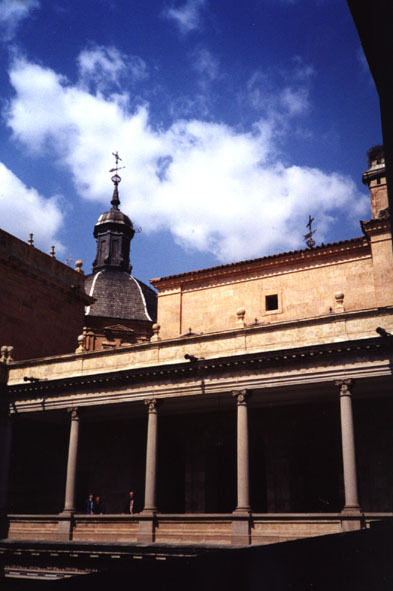 This is the portal of the university of Salamanca. In its ornaments there is a frog (a "rana") hidden. When you have found it click with the mouse arrow on it and you'll see it closer. 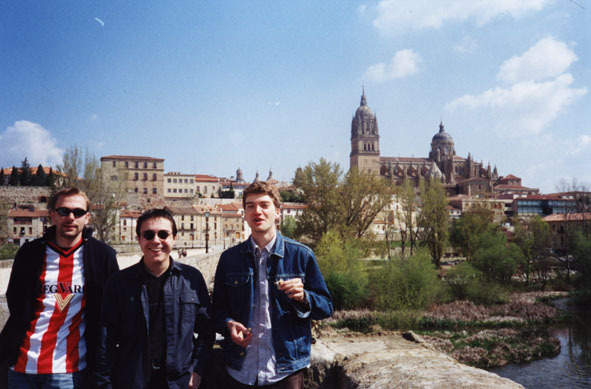 Rune, Tomasito and Alfons on the Roman Bridge of Salamanca. (you'll stumble over them always and ever when you are there). 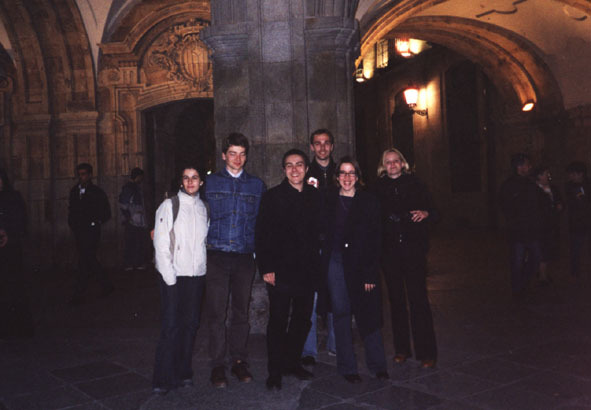 Elisa, Alfons, Tomasito, Rune, Elena and Sandra. Elisa and Elena are two of my friends who I know from Köln. 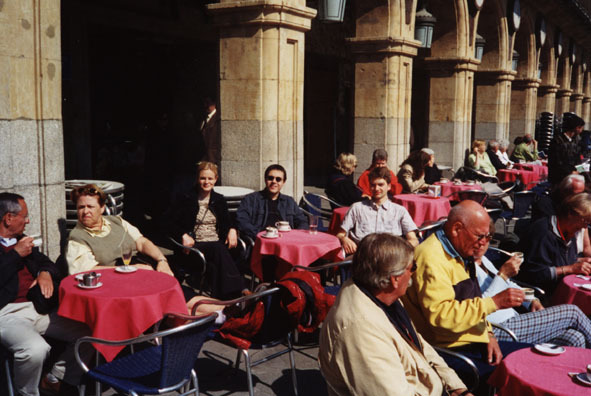 They were in the city at the Rhine about a year ago (2000/01). 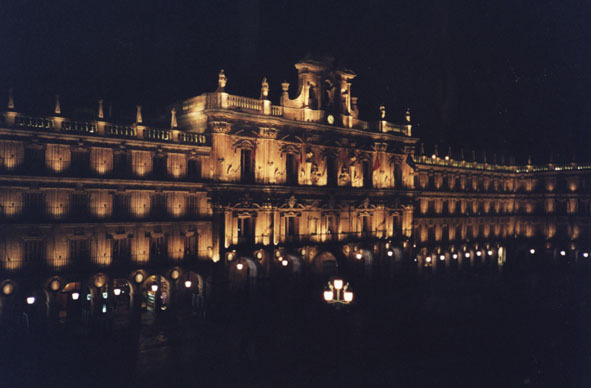 The Plaza Mayor (the main square) in Salamanca is one of the most beautiful ones in Spain. 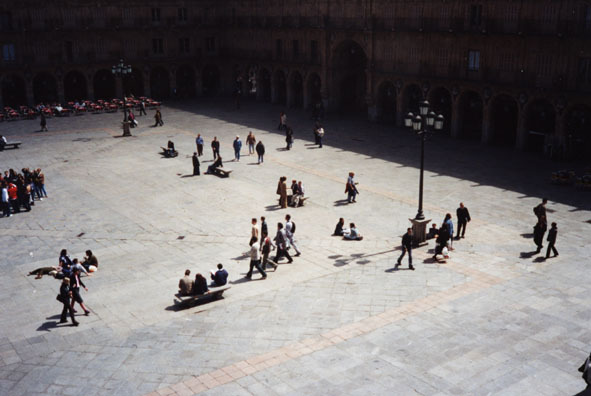 Other Plazas Mayores were modelled after the image of that square, also the one in Madrid. 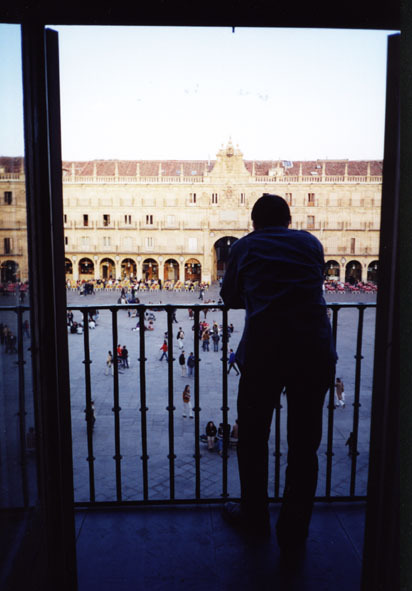 Due to Elisa we had the luck to have our accomodation directly at the Plaza Mayor. And if I write directly, I mean DIRECTLY. We had a balcony heading to the inside of the plaza. An amazing view. And now you ask yourself probably "Wow, they obviously had to pay a lot of money for the room..."´, and I say "If 13 € per person are a lot..."
Photo(s) made from our balcony. If you want to see the same photo at a different time of the day with a splendid sun/shadow/flash play, just click on the image above. The same image, just by night. 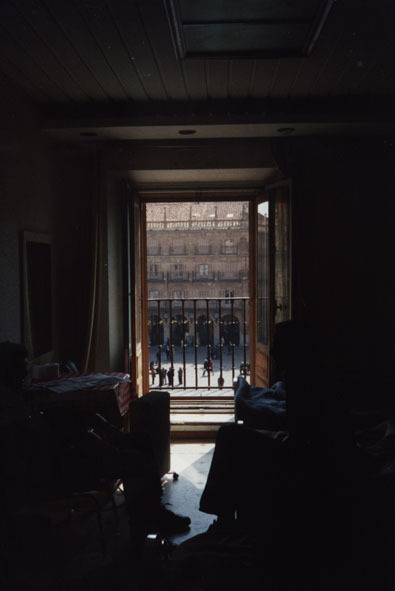 The morning coffee - Sandra, Tomasito and Alfons in the café directly in front of the hostal door. 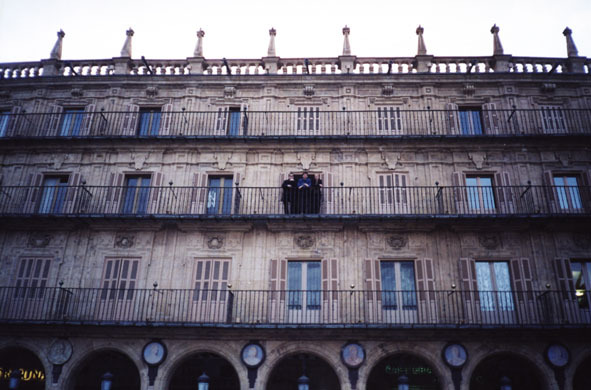 Tomasito, Alfons and Sandra - on our balcony. If you point the mouse arrow on the picture you see how happy we are. Sandra thoughtful on the balcony. Same as above: to see how hard she is thinking point with mouse on the image. The inside of our room. Click on the photo to turn on the virtual light. The Plaza de Baseball. 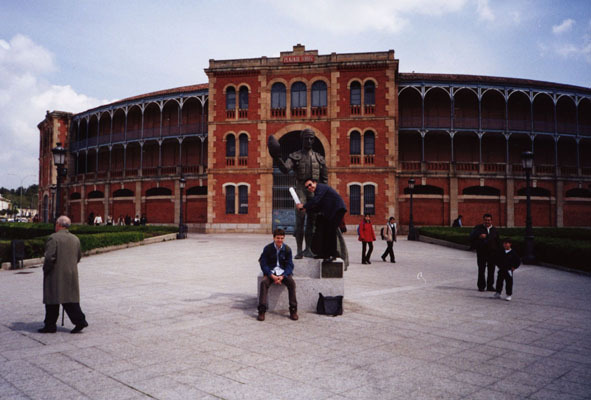 The statue in front is a famous baseball player from Salamanca. In his hand you can see his baseball catching glove.